Optical physics studies the interactions of light with atoms, molecules and semiconductor systems in different contexts. 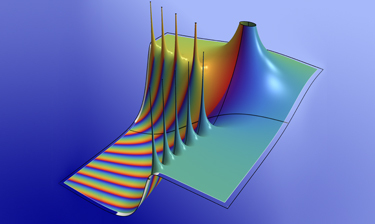 At the College of Optical Sciences, nine different research groups pursue projects in quantum gases, quantum information, theoretical and computational optical physics, experimental and theoretical semiconductor quantum optics, and ultrafast lasers, with impacts to the theory and applications of high-harmonic generation, laser cooling and trapping, quantum control, and much more. To view past updates, see the Optical Physics Update Archive page. Simple patterns, such as stripes, can be created from instabilities that involve linear momentum states of waves. Simple patterns, such as stripes, can be created from instabilities that involve linear momentum states of waves. The group of Professor Rolf Binder recently asked the question whether similar instabilities and patterns involving orbital angular (instead of linear) momentum states are possible. They performed theoretical investigations of polaritonic quantum fluids. Details about their findings are in Phys. Rev. Lett. 119, 113903 (2017). Snapshots of the transverse intensity profile of a light beam propagating in a photon fluid for different propagation distances. The dynamics is governed by a single component nonlinear Schrodinger equation with a third-order nonlinearity. The input beam is an optical vortex beam, and this causes a rotation of the excitation axis. The resulting cyclotron motion can be interpreted as due to an artificial magnetic field acting on the photon fluid. The Theoretical Optical Physics Group headed by Ewan M. Wright conducts research across a broad area including ultrashort nonlinear pulse propagation in transparent media, Vertical External Cavity Semiconductor Lasers (VECSELs), nonlinear optics of photon fluids, and optical binding of particles. In each case the goal is to develop the underlying theory for each area in tandem with the simulation capability for existing or potential experiments. Vortices showing quantum turbulence in a BEC. 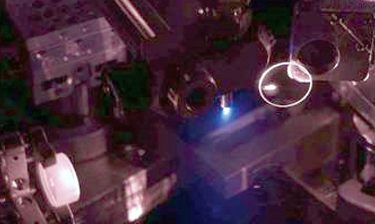 Brian P. Anderson's Quantum Gases Group uses laser light to cool gases of rubidium atoms to a few billionths of a degree above absolute zero. 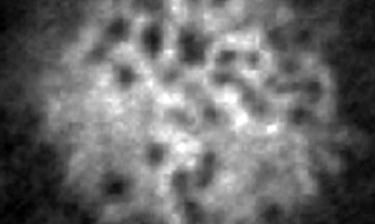 These atomic fluid droplets, called Bose-Einstein condensates, follow the laws of quantum physics and serve as valuable tools for exploring fundamental physics topics such as quantum turbulence, the primary concern of the Anderson group. BEC turbulence is indicated by the motion of vortices, microscopic holes that identify fluid circulation like the eyes of tiny hurricanes. New regimes of quantum fluid dynamics and quantum turbulence can be discovered by watching how these vortices move and interact. 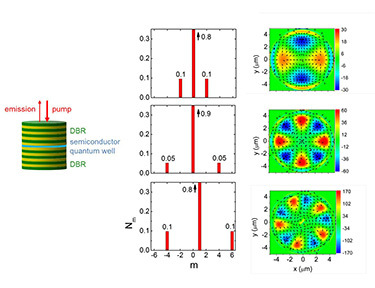 Experiment for production and quantum control of ultracold atoms. Poul Jessen's Quantum Information and Control Group investigates fundamental problems in quantum information science using ultracold atoms. 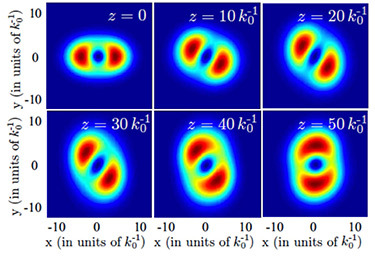 One project uses Zeeman sublevels in the electronic ground state of atomic cesium to explore computer-optimized quantum control, quantum tomography and quantum chaos. A second project creates many-atom spin-squeezed states through quantum measurement back-action, with the long-term goal of improving quantum-limited atomic clocks and sensors. A third project traps atoms in the evanescent field around an optical nanofiber, with the aim of developing an atom-light quantum interface. Ionization of xenon during intracavity high-harmonic generation. The Ultrafast Lasers Group headed by R. Jason Jones employs novel light sources, such as the femtosecond frequency comb generated by a phase-stabilized train of ultrashort pulses, for experimental ultrafast optical science and precision laser spectroscopy. Such sources have enabled studies of temporal dynamics in light-matter interactions ranging from attosecond to several-second time scales, leading to the development of new atomic clocks and subfemtosecond timing. 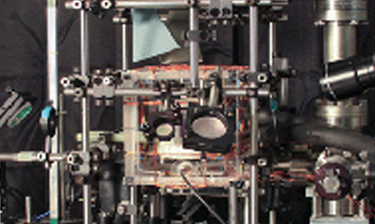 Current activities include precision spectroscopy of laser-cooled mercury and the development of frequency comb sources in the extreme-ultraviolet based on intracavity high-harmonic generation. Resonant-state landscape of a quantum system: It allows economic, yet accurate calculation of nonlinear optical properties. 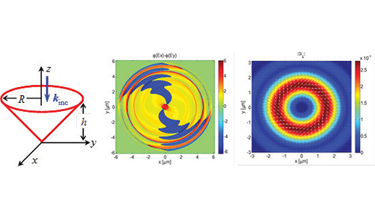 The Theoretical and Computational Optical Physics Group led by Miroslav Kolesik explores the intersection of modern nonlinear optics, atomic and molecular physics, and strong-field phenomena. Research interests span statistical mechanics, Monte Carlo simulation, critical phenomena, nonequilibrium and driven systems, semiconductor laser simulation and optics; current activity concentrates on computational optics, particularly ultrashort optical pulse interactions. Recent work includes first-principle methods to describe light-matter interactions in regimes that defy the tools and notions of traditional nonlinear optics and that scale from the quantum through the optical to the macroscopic. The challenge is in the integration of the microscopic medium description into space- and time-resolved, realistic simulations of experiments. Substantial research is being done in close collaboration with teams in the U.S. and Europe. Light reflected from a hollow cone undergoing changes in spin and orbital angular momentum, as shown by the variation of the Poynting vector and phase in transverse plane. Masud Mansuripur's Optical Physics Group researches optical-magnetic-macromolecular data storage, light-matter interaction, magneto-optical effects and the mechanical effects of light involving the exchange of linear and angular momenta between electromagnetic fields and material media. As an example of the latter effects, the figure above shows a hollow metallic cone with an apex angle of 90 degrees, illuminated by a circularly polarized light beam. Upon reflection from the cone, the spin angular momentum of the beam is reversed. However, no angular momentum is transferred to the cone, because the reflected beam picks up an orbital angular momentum twice as large but opposite in direction to that of its spin. The figure also shows profiles of the phase and the Poynting vector in the cross-sectional plane of the reflected beam. Electromagnetic light bullet transports multiple Terawatts of power over hundreds of meters in the atmosphere. Bottom: Snapshots of the bullet at fixed locations along its path. The bullet itself has intensity spikes (in red) and sheds higher harmonic radiation packets in its wake (to its left). 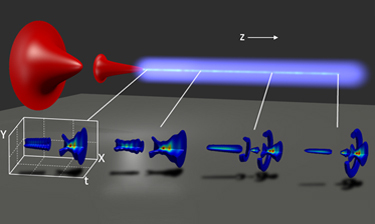 The Theoretical-Computational Optical Physics and Applied Mathematics Group led by Jerome V. Moloney studies ultrashort laser pulse interaction with gases and condensed media under extreme conditions. Extreme intensities acting over tens to hundreds of femtoseconds strip and accelerate electrons from an atom, creating anisotropic distributions of electrons and ions that eventually equilibrate to form a plasma channel. This channel acts like an extended conducting wire and can direct high-voltage charges and, potentially, lightning strikes. Accompanying this explosive event is the creation of a white light super-continuum source that can be used to perform remote spectroscopy and detect atmospheric molecules and pollutants at multikilometer ranges. In another activity, Moloney's team is designing new classes of high-power ultrashort-pulsed semiconductor disk lasers using first principles quantum many-body theory, processing these into laser devices and demonstrating them in the laboratory.